The card front for Galactic Defender. This is the Canadian Grand Toys version. 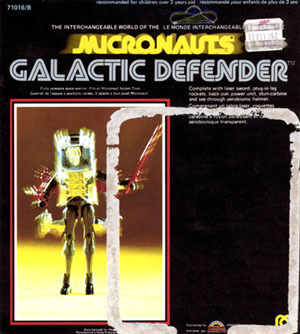 Galactic Defender is the most decked-out of all the Micronauts figures. His oversized helmet came from the Microman Hoodman line of figures; his wand came from the Spy Magician series and his gun, flight pack and wrist and thigh winglets all came from various other Microman figures. He literally has the most stuff to lose and that makes him one of the hardest of the common Micronauts to find complete.